Online payments startup WePay has been on a roll lately. The company is processing hundreds of millions of dollars in payments annually, and adding more than 1,000 active merchants per week. But it wants to accelerate that growth even further, by rolling out payment buttons that will allow anyone to add in-line payments to their sites with just a single line of code. WePay is a Y Combinator-backed startup originally formed mostly to make it easier for groups to collect money and make payments together. But it’s recently gone beyond just helping out groups, providing an ultra-simple platform for anyone to collect and manage payments online. 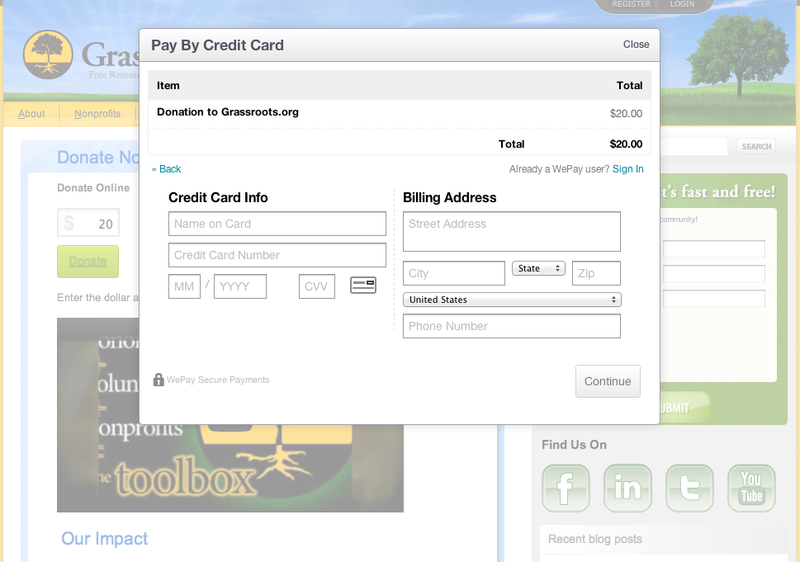 It’s added support for event registration and ticketing, custom invoicing, donations, and e-commerce. A few weeks ago, it even rolled out a white-label payments API and lowered its prices to court third-party developers and better compete against PayPal and others. Now the company is making it even easier for websites to collect money, sell goods, or receive donations, by offering up a way to accept payments right on a client’s website. For site owners, adding a WePay Payment Button is as easy as embedding a YouTube video — they merely add a small cut-and-paste piece of code to the site. Those buttons also enable site owners to take payments directly on a site, without redirecting to a third-party payments site like PayPal. WePay Payment Buttons come in a couple of different flavors — site owners can use “add to cart” buttons, as well as “donate” and “register” buttons. All carry WePay’s typical pricing structure, which is just 2.9 percent and 30 cents per transaction for credit cards, and 1 percent plus 30 cents for bank payments. WePay has raised a total of $20 million since being founded in 2009, including a $10 million round led by Ignition Partners that it announced in May. Other investors include Highland Capital Partners, August Capital, and angels such as Max Levchin, Ron Conway, Dave McClure, and Steve Chen.